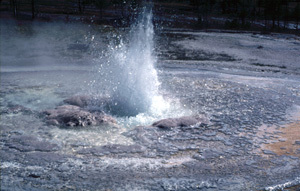 EXPLORE YELLOWSTONE'S HOT SPRINGSBy Participating in a robotic expedition. 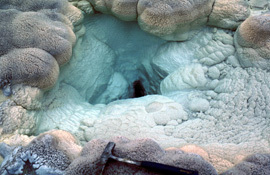 The hot springs of Yellowstone National Park are some of the most extreme environments on Earth, presenting formidable challenges to characterization of the biology, chemistry, and geology of hydrothermal vents. 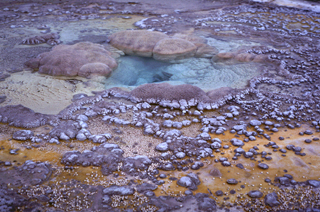 Carnegie Mellon University (CMU) proposes Robotic Exploration and Biological Sampling of Geothermal Vents, a project chartered to investigate and characterize the biological, chemical, and geological components of Yellowstone hydrothermal vent systems. Concurrent with the exploration and analysis of samples, the project will construct an interactive website to promote public outreach and student education. The outreach activities will cultivate cross disciplinary discussion between the research community, educators, and the public. Education and public outreach will address basic microbiology and geology issues by asking such questions as "What is life?" and "How do we find life in an extreme environment?" "How do we tell the difference between biological and geological material?" This web page is a limited example of the type and level of information that the project intends to disseminate to the public. For this demonstration, we have chosen to focus on one hot spring, Bead Geyser.